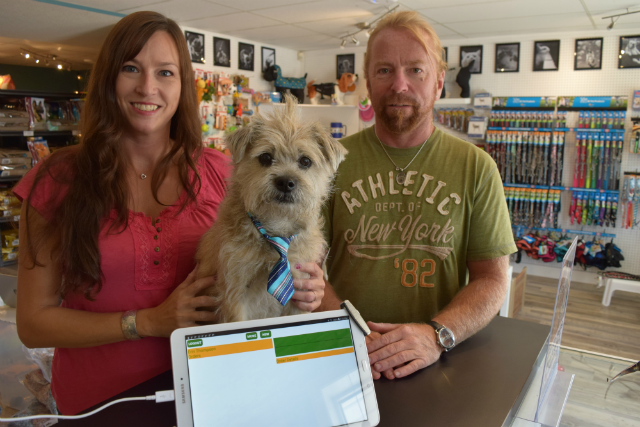 Kimberley Kritters Pet Boutique is the latest merchant to select POS-n-go as their point-of-sales system. Owner Erin Thompson and partner Brian Sondergaard just open Kritters August 4th at 550B Mark Street. They have everything you need for your dog, cat, hampster, even fish food. When asked about POS-n-go, Erin said, "Easy peasy, love it, the training required was minimal basically an hour is what we spent and we had it down pat." With 1000s of products, keeping track of inventory was paramount for Erin and Brian. Trying to do that on paper was just not possible. "We just did our first inventory re-order and it was very very simple. I can print a report by supplier, it gives me the supplier codes and quantities." Then she just sends the PDF report or CSV file to the supplier, and its done. She's happy, the supplier's happy. No stress accuracy! Welcome to the POS-n-go family Mr. Wilson, you too Erin and Brian.